If you are a pro hiker/camper and aim to climb higher altitudes or stay longer period outdoor, then you need a pro stove, like Jetboil MiniMo Personal Cooking System which can do something thing more than just boiling water. Let me share my story. I am a great fan of the Jetboil stoves and have been using their personal cooking system for several years. It is really fine for the solo backpackers, like me. However, six months ago, I heard about the Jetboil’s MiniMo. In fact, it is the modified version of Jetboil’s previous models, like Solo, Flash or Zip. Researching on this model, I have found that it is more user-friendly and highly efficient than many other backpack stoves out there. In this post, I am going to describe the key features, pros, and cons in this Jetboil MiniMo Stove Review. Hope it would help you! What keeps the Jetboil stoves ahead from the other similar priced alternatives or even many pricier models in the market is their exclusively designed cooking pots. And Jetboil MiniMo Cooking System presents this cooking pot with a modified version. The other Jetboil models, like the personal cooking system, solo, Flash, etc. bear cooking pots with narrow structure featuring greater height with lesser width. In case of those cooking pots, the depth can create some difficulties when you try to eat the food using spoons or forks. In this Minimo model, the cooking pot comes with a much bigger size and/or larger volume (1 liter or 32 oz.) with a wider shape and a lesser height. Minimo model’s redesigned cooking pot offers two added benefits. First, it lets you to boil/cook a greater amount of water/food comparing to the previous Jetboil stove models. Second, Jetboil MiniMo System offers lower spooning angle. It allows you to consume a hot meal directly from the cooking pot using a spoon with greater comfort. Like the previous models, Jetboil MiniMo stove’s cooking pot this built with hard anodized aluminum. You may ask that why aluminum? The first benefit of using Aluminum is that it is light-weight and the second benefit is it’s greater heat distribution efficiency. So, while you try to cook with this pot, the aluminum-construction can distribute the heat more efficiently throughout the pot-bottom. This process enables the burner to cook the food properly without burning. The Jetboil cooking pots come with efficient heat exchanger construction. This is a patented feature of the Jetboil stoves. It includes exclusive FluxRing Technology. It helps the cooking pot to clip-in with the Jetboil-burner firmly. When this aluminum built cooking-pot gets directly connected with the burner, it can distribute the heat faster. This modern technology can also minimize the heat-loss of heat. Adding to this, it facilitates the stove work as a built-in windshield. Jetboil MiniMo Backpacking Stove’s cooking pot bears a neoprene cover outside it’s body. It serves two purposes. First, it protects your hand from getting burned when you directly touch the cooking pot during boiling/cooking. Second, it keeps the inner contents remain hot for a long time after ending the cooking process. But how? The magic formula is that it is insulated. Interestingly, this cover bears a small sleeve, which allows you to keep spoon or fork inside it. Unlike the Jetboil Solo, Zip or Flash model’s nylon strap-made pot holding system, Jetboil’s Minimo model comes with a pair of metal-built handles. Those are strongly riveted to the pot-side. Furthermore, these handles bear rubberized grips, which keeps the hands safe from getting burned. The is truly helpful when the burner is on simmering mode and you need to hold this pot for stirring the food properly. What is more, if you wanna cook a meal the cooking pot would gain some extra weight, then these metallic handles would help you to lift up the fuller pot from the burner after cooking. What is more, these handles are collapsible. So, they waste zero space while packing. The previous Jetboil models – such as, solo, Flash, etc. – are good enough only for boiling water, preparing coffee, instant noodles or similar dehydrated foods, but not for cooking a meal. 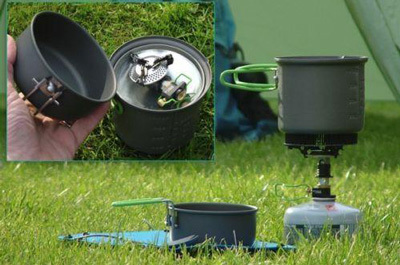 The most amazing thing about the Jetboil MiniMo’s cooking pot is that it is efficient for cooking meat or vegetables. So, I wanna address this model Jetboil’s ‘pro’. It bears some handy parts, like electric igniter, and pressure regulator. Jetboil MiniMo Backpack Stove System’s burner is small but efficient. It is built with stainless steel material. It is sturdy and rust-proof. It’s well-efficient design bears some holes, which allow it to clip-in with the large cooking-pot. In this latest model, the Jetboil company has upgraded their previous models’ burner-head with a more efficient simmer control. It makes the flame control process much easier and allows you fine tuning the burner-heat depending on what you desire to boil/cook. Jetboil’s MiniMo Stove can boil about 16 oz. or ½-liter amount of water in about 2-minute and 15-second period of time, which is faster than many other pricier backpack stove models out there. Like the other Jetboil stoves, this Jetboil MiniMo System model is easy-to-lit. It comes with a built-in electric piezo igniter. 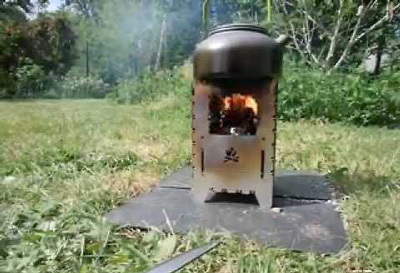 With a single press, it can light the stove within a moment. So, it gets you rid of lighting the burner using match or any other thing. However, you can keep another ignition source with you for added safety, as from years of experience I have seen that an igniter wears out eventually. Another great feature of Jetboil MiniMo Cooking System is it’s enhanced and improved regulator diaphragm. This addition makes the fuel pressure regulation task much efficient than the previous jetboil models, like Solo, Zip, Flush, etc. This Regulator technology can control the wire-fuel’s movement more efficiently to utilize the optimal power of the burner. It can provide a good simmer, even if the temperature falls to 20 degree Fahrenheit. This Jetboil MiniMo Personal Cooking System kit includes a small-size cup. It is built with a quality plastic material. It is placed below the big cooking cup, as a protective gear to it’s FluxRing structure. This translucent cup includes measuring marks on it’s wall, which would facilitate you to add right portion of water in the Jetboil cooking pot. This is another modification of Jetboil’s previous models, where the cup comes without such measuring marks. Furthermore, this cup is fine for eating food, especially while you wanna share some food/water with another person. It is a little thing with a great prospect. While you cook outdoor, the ground is obviously not plane like your home-kitchen’s countertop. So, the unit may become unstable and lose balance. Just imagine, after a long tiresome day, your cooking pot just fell off on the ground and the total food/water is wasted. If you have jetboil’s tripod stand, it won’t happen to you. Another advantage is you no more need to carry/store this stand inside the cooking pot. Because, you can integrate this stand with the cooking pot’s lid. The Jetboil company makes the optimal use of every part of their stoves products. For instance, the lid offers greater service than a mere cover. This lid contains a large hole, which allows you to sip-through the inner contents directly from the cooking pot. And of course, it is insulated, so there is zero risk of burning lips. It relieves you from the hassle of shifting the food to another pot. And, if you look close to the lid provided with Jetboil MiniMo Stove, you will see three rows of little holes. They serve as strainers for water, coffee, soup, or any other type liquid. This is a clever addition to the latest Minimo model, which you won’t find into Jetboil’s previous Flash stove-lid. Another advantage is it’s translucent structure. It allows you to observe the condition of inner contents without opening the lid. It not only saves your time and heat; but also protects the food from getting overheated. What is more, the lid bears a ditch-like arrangement to store the tripod-base firmly. Another great advantage of buying Jetboil stove unit is that it can turn into a compact size. All you have to do is put the burner inside it’s cooking pot, place the tripod stand on the lid and fit the small-cup on the cooking-pot’s bottom. Even you can fit the fuel canister (small size, 100-gram) inside it’s cooking pot aiming to save some packing space. This compact storage facility saves you from losing the stove-parts or leaving them behind at home or elsewhere. However, if you wanna carry a larger fuel canister (above 100-gram), it won’t fit inside this cooking-pot. So, you have to carry it separately. When packed it weighs only 14.6 oz. with dimensions about 5-inch x 6-inch or (127-mm x 152-mm). Thanks to Jetboil, as their intelligent stove designs has made the hiking/trailing tasks much easier for those people, who prefer the canister based stoves. 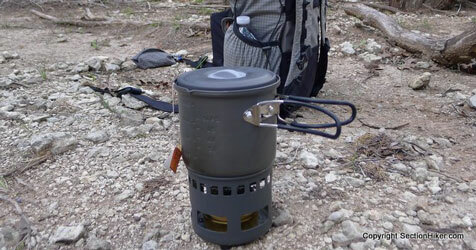 Jetboil Minimo Backpack Cooking System runs with isobutane-and-propane type fuel. The Jetboil Jetpower canisters are sold separately. One Jetpower Jetpower fuel canister (100-gram) can provide enough energy for boiling about 12 liters of water, which equivalents to about 100 cups (i. e. measurement cups) of water. The Jetboil stove rocks not only for better design and/or greater performance; but also for their color variation. While most of the companies release only a single color-option for their stove models, the Jetboil company offers a range of color diversity for their stove models. The Jetboil’s MiniMo is available under eight models with diversified color options: gold, green, blue, carbon, sapphire, and violet. However, the size of all of these Jetboil Minimo stoves is invariable keeping all features same. You May Also Like this Video on Jetboil Minimo Stove Review. Cooking-pot bears metallic handle with a collapsible design. Efficient simmer controlling ability offers diverse cooking options. Piezo igniter makes the burner easy-to-lit. Boils 16 oz. water in 2-min 15-sec. Translucent Pot lid with strainer and sip-through hole. Volume measurement-markings on the walls of the cooking pot and small cup. Small Plastic cup to measure water/cooking ingredients and to eat food. Compact design minimizes the packing space. The stove-design shields the fire and it is quite hard to monitor flame while cooking. Comparatively Pricier than average backpack stoves. Jetboil MiniMo Personal Cooking System is an advanced version of the previous Jetboil stoves, like Solo, Flash, personal cooking system, etc. All of these models have earned huge popularity among the hikers and/or campers. This ‘pro’ Jetboil outdoor stove offers more user-friendly design still harnessing the price-tag under an affordable range. Certainly, Jetboil Minimo Stove is one of the best backpack stoves 2019. Buying Jetboil’s Minimo Backpacking Stove, you make yourself more than ready for adventurous camping anywhere. Jetboil Zip Personal Cooking System Review. Jetboil Flash Personal Cooking System Review. MSR Whisperlite Universal Stove Review. Solo Stove and Pot 900 Combo Review.